"Double Cast" Broadcasting station will be open for a limited time at Tokyo Wonder Site Hongo. The filming studio and the administration office that are created by two artists, Masaru Iwai and Yukihiro Taguchi, will be installed at the station. The actual visual programs will be filmed and edited in the studio, and they will be distributed on the "Double Cast" site and YouTube site. This exhibition attempt to explore the new ways of delivering exhibition and the various ways of enjoy viewing it, through distributing the exhibition from two sites, on the web and at the filming site (Tokyo Wonder Site Hongo). During the exhibition period, the station will be an open space for a lively communication. The talk events will be held on every weekend at the site, and two artists will show the performance as needed. The latest program is available to view on: http://doublecast.survivart.net/en/, so please come and join us at the station. 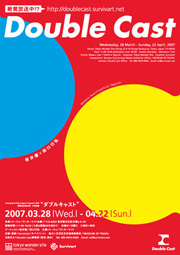 In the exhibition, we use “YouTube” which is a popular moving image site. The issues regarding to the animations and TV drama copy right are often became a topic of “You tube”. We invited two guests, who are experts on contemporary art practice and internet project to discuss a problem with networking and a potential. The Camp is an event which is consisting of a presentation, a discussion, and a party. We held our camp once a month in a different location each time. In the first part of the camp, two participants artists, (Masaru Iwai and Yukihiro Taguchi) of the exhibition will make a presentation of their each works, and in the later part, a discussion of the theme “Duality”, that is a theme of the “Double cast” will be held with the audience. The advertisement use media to urge consumer’s desire. Then, what kind of elements would be hidden behind the effectiveness of the advertisement? We will ask inside out story of the advertisement world from the two guests, who are working from publishing new magazines to the environmental advertisement, to rethink the meaning of the desire. Now that more than 50% people said to be recognized “You Tube”, it is possible to transform an individual sender into a receiver of the information, through a full use of the media. As we see the myth of the mass media has collapsed, we would like to discuss what would be the points and the prospects of possessing our own media. Furthermore, how the value of the art can be evaluated in the society that is rapidly heading towards a new networking society. We will critically argue about the artist’s practices in the year zero and the act of the curation from various views. The closing party of the broadcasting station “Double Cast” will be held after the talk. Let’s enjoy our last night with everyone who has contributed to the exhibition!